Ian and Maria had acquired a cruck framed barn conversion in rural Montgomeryshire with planning permission already granted for a four bay garage and store adjacent to their impressive historic dwelling. Ian was determined to create a building that did justice to the vernacular architecture, would last for hundreds of years, and respect the craftsmanship and tradition of his neighbouring house. From the outset it was obvious he wanted more than just a standard kit framed outbuilding. Within 2 days of an initial enquiry, Rob had visited the site and come up with costings and ideas for a bespoke design in green oak based on impressive curved sling brace trusses which mirrored the cruck blades in Ian and Maria’s house. As well as creating an outbuilding suitable for use as a garage, the brief was also to design in sufficient flexibility for the building to be converted to living accommodation in the future. With this in mind, the bays are left open with vaulted ceilings along the length of the building, exposing common rafters, purlins and curved wind bracing. Not your average garage! Despite having spoken to several timber frame companies, Ian chose to go with Castle Ring Oak Frame, and work began on detailed frame drawings. Within a couple of weeks these had been approved, and Ian was able to instruct his groundworkers to begin excavating the tricky sloping site, in preparation for the footings and the building up of block and natural stone walls for the frame to sit on. The oak was ordered and a target date for raising the frame agreed in 8 weeks. There then followed one of the wettest summers on record which can’t have been much fun for the groundworkers, but Rob didn’t care or even notice – he was in a warm, dry workshop! Well, raising day came around eventually, and of course the sun shone. The awkward nature of the site’s access meant that the frame had to be unloaded from the trackside by the crane. Despite this frustratingly slow start to the day the raising crew soon got into the swing of things and by 4 in the afternoon the last few pegs were being driven in, watched intently by Ian and Maria’s flock of pet alpacas. Beautiful sustainable oak framed houses and oak frame buildings from Castle Ring Oak Frame. 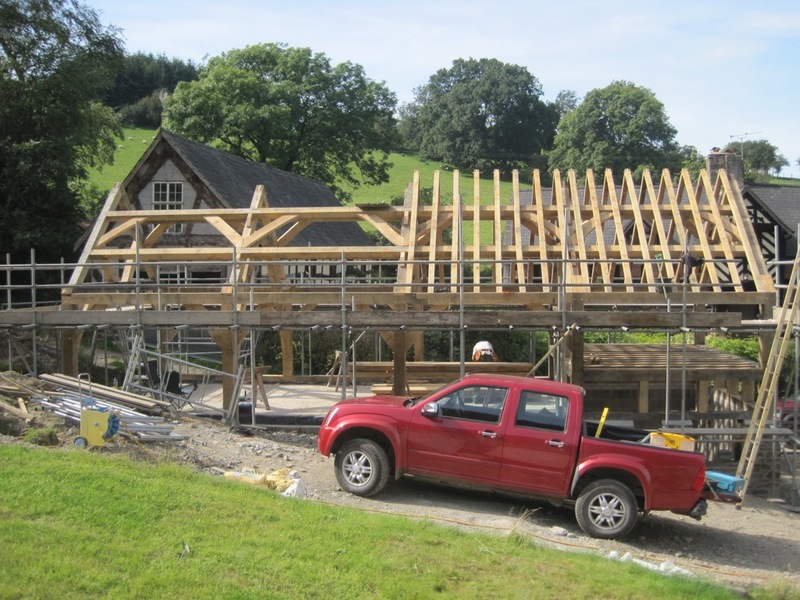 Combining traditional timber framing skills with modern energy efficient construction. We specialise in eco houses and self build.